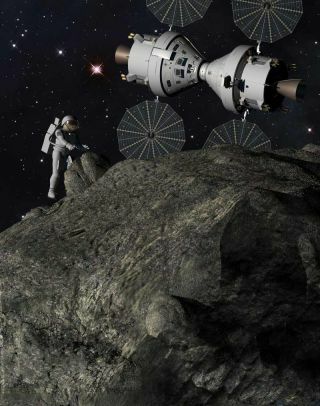 This artist's illustration depicts a 'Plymouth Rock' asteroid mission with astronauts and NASA's Orion spacecraft as envisioned by Lockheed Martin. Nearly 50 years after the first human spaceflight, NASA is currently in poor shape to send astronauts on long deep space voyages because the agency's life and physical sciences program has shrunk dramatically in both size and scope in recent years, a new report suggests. The report, entitled "Recapturing a Future for Space Exploration: Life and Physical Sciences for a New Era," was released today (April 5) by the council to help set an agenda for research in the next decade. NASA's success in human space exploration to date has dependedonstrongprogramsstudying important questions inlife and physical sciences. A forward-looking portfolio of such research could help lead to interplanetary voyages and advance fundamental knowledge of life, materials and technology that can lead to spinoff benefits on Earth, the report noted. However, several years of budgetary challenges and priority being given to other programs at NASA have left the agency's life and physical sciences program no clear institutional home and led it to dwindle significantly, according to the committee that wrote the report. As a result, NASA is now in poor shape to take full advantage of the unparalleled opportunities presented by the International Space Station's laboratory environment. "At some point in the 2001-2002 time frame, life and physical sciences research was an integrated program, receiving about $500 million per year," said Elizabeth Cantwell, co-chair of the committee that wrote the report and director of mission development at Lawrence Livermore National Laboratory in California. "There were a number of reorganizations and changes between then and 2010, with the biggest change in the 2006-2007 timeframe, and a number of lines of research were either parceled out to new management structures or eliminated." "It's hard to track how much funding was eliminated, but it looks like it's down to $150 million to $200 million, so a lot of fundamental research was cut," Cantwell told SPACE.com. The report concludes that reestablishing the program under a single management structure housed in an appropriate part of the agency will be key to the program's success, although the committee makes no recommendations as to what that place might be. In addition, they add that a stable and adequate funding base is needed to support a robust research program that attracts top scientists. "A focused life and physical sciences program can make possible the achievements that bring the space community, policymakers, and the U.S. public to a realization that we are ready for the next significant phase of human space exploration," Cantwell said. An effective countermeasures program to fight the adverse effects of the space environment on the health and performance capabilities of astronauts, which would make prolonged human space exploration missions possible. The effects that gravity or lack thereof has on biology, a deeper understanding of which could not only help astronauts fight loss of bone in microgravity but also perhaps slow the loss of bone with aging. Orbital fuel depots for cryogenic rocket fuels. Collecting or producing large amounts of water on the moon or Mars. Advances stemming from research on fire retardants, fire suppression, fire sensors, and combustion in microgravity that provide the basis for a comprehensive fire-safety system, greatly reducing the likelihood of a catastrophe. Regenerative fuel cells that can provide power for long periods at high rates, of use not only in the dark on the surface of the moon but potentially on Earth. "Research in the life and physical sciences can enable space missions and, as a unique benefit, there is critical research that can in turn be enabled on Earth by access to space," said Wendy Kohrt, professor at the University of Colorado, Denver, and co-chair of the committee that wrote the report. "With the advantage of the space environment, we believe there is an opportunity to significantly advance fundamental scientific understanding." The committee that wrote the report has met with NASA and congressional staffers about their findings. "It's being taken seriously," Cantwell said. "The challenge they have to take into consideration is how we make the next decade or two decades of important research happen, to keep human space exploration not just in existence but moving forward."